Decades ago, we all thought that virtual reality would be the next big thing. We envisioned big VR helmets and endless worlds that we could adventure through forever where all of our senses would be engaged. There were some problems with our conception of VR, though, and it fell out of our collective future, mostly because of cost and technology constraints. But quietly, in the background, companies are still developing virtual reality technology. Just a few years ago, Sony filed a patent for technology that would allow a virtual world, complete with sounds and smells, to be projected directly into the brain. And a European research project called Cyberwalk is working on another challenging aspect of the VR environment: locomotion. 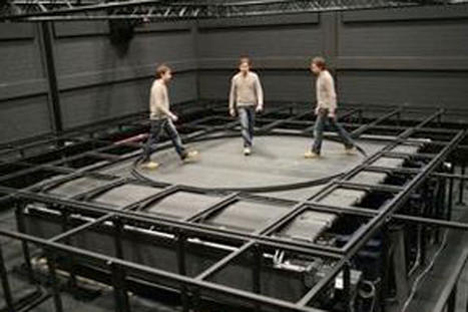 The omni-directional treadmill called CyberCarpet created by Cyberwalk would revolutionize the way virtual reality is used for therapy, training, architecture and, eventually, gaming. A traditional treadmill, of course, only moves in one direction. Walking straight ahead at all times doesn’t allow for full immersion in a virtual world. Other solutions, such as a large sphere that the user manipulates from inside, have been proposed but are plagued with problems. The omni-directional treadmill works by densely packing small balls under a walking surface and letting the friction of the user’s shoes do the moving. The kinks are still being worked out – namely stopping and starting – but based on the above video it looks like the CyberCarpet is in a pretty great place already. The device has already been used to take a few lucky individuals on a virtual walk-through of ancient Pompeii. Next stop (we hope): Lawnmower Man-type virtual worlds. See more in Home & Personal or under Gadgets. November, 2009.